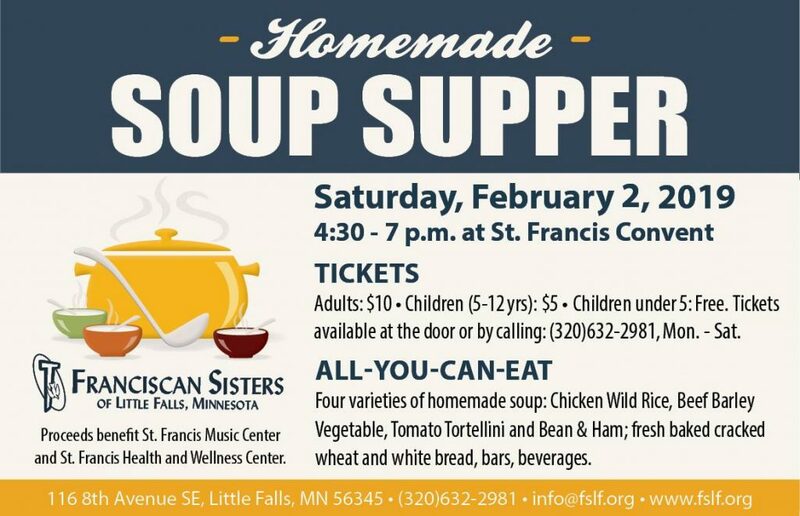 The Franciscan Sisters of Little Falls will host an all-you-can-eat Soup Supper on Saturday, February 2, 4:30-7 p.m., at St. Francis Convent, Little Falls. Four varieties of homemade soups—Chicken Wild Rice, Beef Barley Vegetable, Bean & Ham and Tomato Tortellini; fresh baked cracked wheat and white breads, homemade bars and beverages will be served. Ticket prices include: Adults–$10; Children 5-12 years–$5; Children under 5 years—Free. Dinner tickets will be available at the door or by calling (320)632-2981. Proceeds from the Soup Supper will benefit St. Francis Health and Wellness Center and St. Francis Music Center, Little Falls. For more information, contact (320)632-2981 or info@fslf.org; www.fslf.org.